With James Braid and J H Taylor, one of the "Great Triumvirate". Made clubs when at Ganton and Totteridge but most clubs bearing his name are autograph series from Stewart or Spalding. 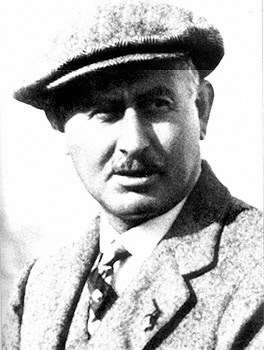 Born on Jersey on 9 May 1870 he saw his brother Tom making a living as a golf professional in England and, despite having played very few games of golf in his life, secured a job as a professional at the Studley Royal 9 hole course in Ripon in 1890. After two years he moved to Bury and in 1896 to the Ganton club in Scarborough. The members at Ganton financed a challenge match between Vardon and J H Taylor which Vardon won convincingly, 8 and 6. That same year he won his first Open Championship at Muirfield. He won again in 1898 and 1899 then crossed the Atlantic to play a year of challenge and exhibition matches and taking in the 1900 US Open which he won at Wheaton, Illinois. In 1903, at the peak of his powers having won the Open for a fourth time, he contracted tuberculosis and many biographers attribute his subsequent 'decline' to the effects of this illness. This may be so but he still won the Open Championship in 1911 and 1914 establishing a record of six championships which will probably never be beaten. In that same year of 1903, he became pro at South Herts in Totteridge and remained so until his death in 1937. Most people with even a casual knowledge of golf will have heard of the Vardon grip, the pinkie of the right hand overlapping the index of the left, which he popularised. Despite it bearing his name it was most probably the invention of the great Elie amateur, Johnny Laidlay.